D.C. Bloom has a way with words. However, to fully understand his music you first have to know that this former FBI speechwriter left Washington, DC for the rolling hills of Texas late in life. 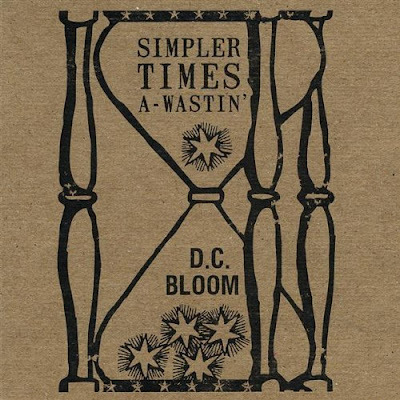 "Simpler Times A Wastin'" is D.C. Bloom's debut album, and his lyrical prose and passionate love of music shines through on every track. Indeed, Bloom often quotes Bonanza's Hoss Cartwright, "It's better to bloom late than to never bloom at all." D.C. Bloom has a traditional country sound mixed with a little mischievous fun in his superb lyrics. "Simpler Times A Wastin'" starts off strong with with the melodic "Acres To Plow," which showcases Bloom's harmonies with Terri Hendrix along with Texas music legend Lloyd Maines on steel guitar. The biggest surprise of the album is the tender "Precious Memories." It's evident that D.C. Bloom feels the power of his faith in the lyrics while he remembers his childhood and beloved family members who have already passed. The most fun on "Simpler Times A Wasting" is the humorously titled "Headturner From Texarkana," which provides shout-outs to many fine cities in East Texas and Central and Southern Arkansas. This song will be a definite crowd-pleaser. D.C. Bloom's true strength lies in his interesting, intelligent lyrics, and this singer-songwriter is a born entertainer who loves country music at the core of his being.